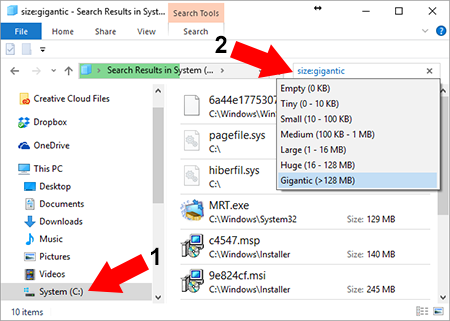 In the following simple solution, I’ll show you how to find largest files on Windows. This process should work from a running Microsoft Windows 7,8, or 10 environment. As disk space begins to fill up, it’s often nice to know what files are consuming the most space. Especially if your drive is almost full and you want or need to remove some unnecessary files to reclaim some of your precious disk space for other files. Open a file explorer window by pressing Win+E on your keyboard. From the left pane, 1.) Select the the drive you would like to search. 2.) At the search box in upper right hand corner, enter Size:Gigantic then press Enter. File explorer search will proceed to locate the largest files and as a result, populate the file explorer window starting with the largest files found first. Making it easy to see which files are taking up the most space on your selected drive. This concludes my simple tutorial on How to find the Largest Files on Windows. Hopefully it has helped you sort out your drive space.